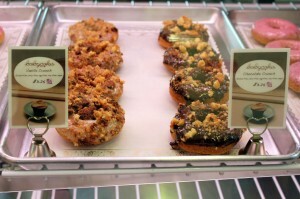 Late last year, a new bakery opened in Downtown Disney. BabyCakes NYC can be found near the T-Rex restaurant where McDonalds used to be. Although, if you’re looking for a sign to lead you the right way to delicious vegan baked goods, you’re not going to find one on any building. For some odd reason, BabyCakes NYC has no sign on the outside of the building that they occupy. You’ll find them located inside of the Pollo Campero/Fresh-A-Peel building. For those of you that know some spanish you may be pausing and going, “Huh?” Pollo = Chicken. Not quite where you’d expect to stumble upon a gluten-free, wheat-free, soy-free, casein-free, egg-free, vegan, kosher, and mostly refined sugar-free bakery. I’ve probably just scared some of you off, haven’t I? Some of you might be wondering what the heck are in their sweets then? Well, to sweeten most of their products, they use agave nectar, a syrup found in cactus. I know it’s skeptical but you have to trust me. 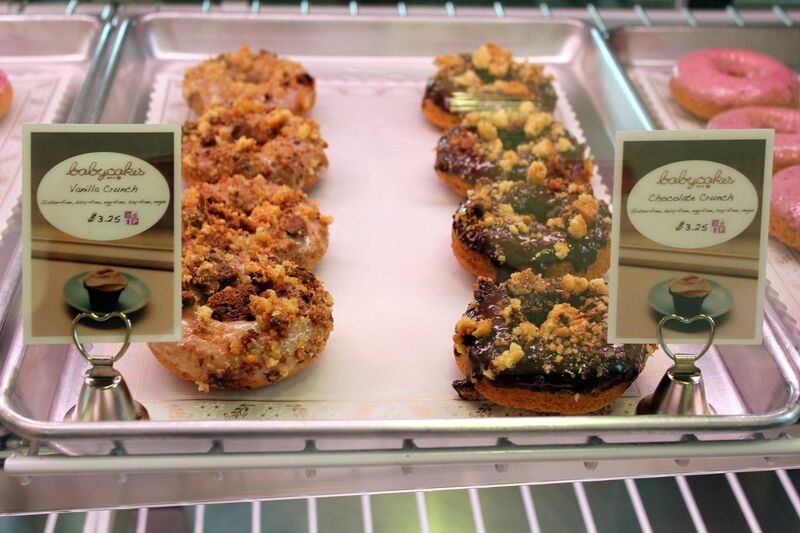 If you take one bite of their Chocolate Crunch Donut you will absolutely be hooked. And I’m not just saying that because I’m a crazy vegetarian and I’m trying to convert you to the dark side. I swear. There really isn’t an atmosphere to BabyCakes NYC location since it’s tucked into a corner of a building that it quite frankly… doesn’t belong in. Although, I could see them having their own stand-alone location because the bakery seems to have their own pleasant retro vibe with nice neutral, sunny colors. On my multiple trips to BabyCakes NYC during a long weekend trip back in March, I experienced many of their options available. Even though it was 10:30 in the morning I allowed myself to indulge in a Vanilla Crunch Donut and a Blondie Cupcake. I was advised before ordering that the Chocolate Crunch was actually the better of the two but I tend to like vanilla so I went with my gut choice. While it was delicious… the woman behind the counter was right. I tried the Chocolate Crunch a few days later and it was phenomenal. The donuts run for $3.25. For only a quarter more you can indulge in a variety of cupcakes. The selection available changes every day but you can undoubtedly find something that sounds good to you. Over the course of my trip I tried a Blondie Cupcake and a Pumpkin Cupcake. I’m not much of a pumpkin fan so I can honestly say it didn’t do much for me. My traveling companion, however, said it was pretty good. I found the Blondie to be moist and flavorful. The added chocolate chips brought some welcome texture to my mouth. I actually think the frosting was the highlight of the cupcakes since it’s not overly sweet. Though you won’t find a huge variety of cupcake flavors like you would at a big city, sugar filled, cupcake centric bakery… you’ll be pleased enough to find flavors like vanilla, chocolate, blondie, red velvet, lemon, and pumpkin. Keep in mind that the selection changes daily with some options being seasonal. 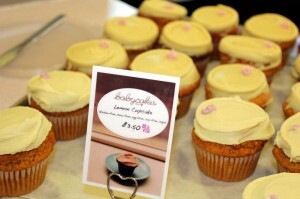 For daily flavors, be sure to follow BabyCakes NYC on Twitter. 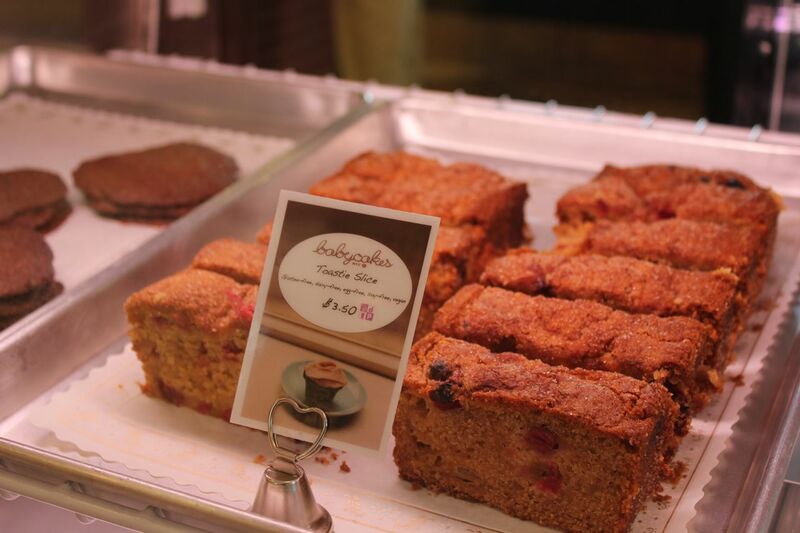 The true delicious surprise that I found at Babycakes NYC is the Toastie Slice. Just typing it I’m honestly salivating. Loaves of different varieties are baked and served by the slice for $3.50. The Toastie Slice is a cranberry and apple bread type creation that has fantastic texture and flavor. Sadly, I tried that on my last trip to Downtown Disney because otherwise I would have JUST ordered like four of them and scarfed them down like a little kid that was just given money and then released into a candy store. I find BabyCakes NYC to be reasonably priced… especially for the quality that you are getting. Any type of Cookie Sandwich (two cookies, scrumptious frosting inside) runs you $3.50 while a single cookie is only $1.25 as are the Brownie Bites. If you get your treats to go, they’ll even package them in a cute box for you at no additional charge. Should you choose to enjoy your baked goods inside there is ample seating in the building as well as a small section outside. 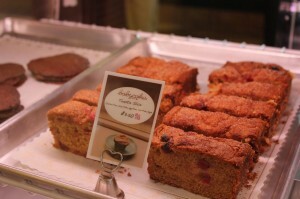 For those of you that use the Disney Dining Plan, you’ll be happy to know that BabyCakes NYC participates! Snack credits are accepted and if you grab an entree from Pollo Campero or Fresh-A-Peel, you can redeem your dessert from BabyCakes NYC since they share a register area. 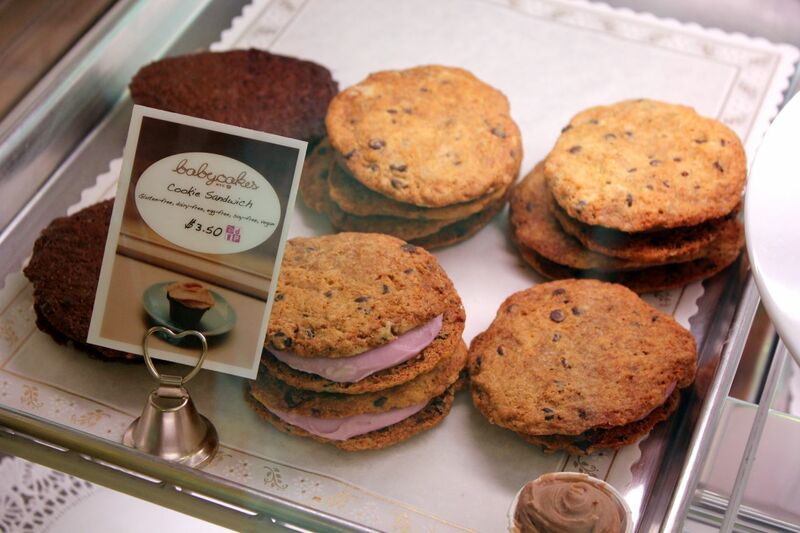 I honestly feel like you’re getting quality baked goods at BabyCakes NYC. Many times I’ve heard that standard Disney cupcakes on property are too sweet and much too decadent for some taste buds. Even though I loved a good sugarrush as a kid, I try and eat more health conscious now. It’s always a plus when something that is healthier for you tastes just as good, if not better, than it’s sugar induced alternatives. Planning a birthday at Walt Disney World for a friend or family member with dietary restrictions? BabyCakes NYC has you covered! You can order a custom birthday cake or any of their other treats for your special occasion. Maybe I’m used to eating “different” things being a vegetarian and I constantly have to keep an open mind when trying new textures and flavors. I believe that’s what anyone that tries BabyCakes NYC will have to do. Just try and remember the quality of ingredients that are used in what you are consuming. Many of us are accustomed to overly-processed, sugar rich desserts that are over the top decadent. It’s sort of like a breath of fresh air to find a bakery that allows people with dietary restrictions to try something new. Whether you’re in the mood for a morning sweet or a late-night treat, Babycakes NYC can take care of your cravings from 8 a.m. to 11 p.m. daily. I do not believe this BabyCakes has received Kosher certification yet. Yes! We are proudly, officially certified kosher pareve by Florida K.
We love eating at Pollo Campero. Hubby and daughter get chicken, while I have the absolutely delicious – and vegetarian – black beans, rice & plantains, with condiments from the salsa bar. I haven’t yet tried anything from Fresh-a-Peel, because I love my beans & rice so much, but it’s next on my list of things to do. After our meal, we head over to Baby Cakes for dessert. Truly scrumptious! To those who may being going, “Ick,” on the inside, let me make a comment. I am a true dairy loving, bread eating, carnivore. I also live in a family of severly dairly, gluten, and soy allergic people. The types of treats offered in places like this one are typically out of this world delicious, so much so that I’ve started teaching myself how to cook a lot of them for my family. Go in with an open mind and you’ll be very surprised. 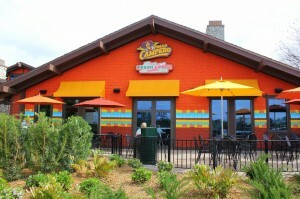 Also, we are crazy about Pollo Campero (hooked on it after a few trips to Central America where they are common) and can’t wait to stop in there on our next trip down since there aren’t any around where we live! Thank you for the great review and pictures. I have always wanted to try this place, but it is hard to find info on it. Your pictures convinced me to go. I will be using my snack points here in September! I LOVE Babycakes! We went there every day of our week long trip. I have a soy allergy and soy is remarkably hard to avoid, especially in baked goods. I don’t mind making my own treats at home, but it’s SO nice to be able to have baked items when eating out. My companion was a bit concerned about all the “alternative” ingredients but really liked the brownie and blondie cupcakes. I can’t wait to back in January! Emily at Babycakes is mad cute. 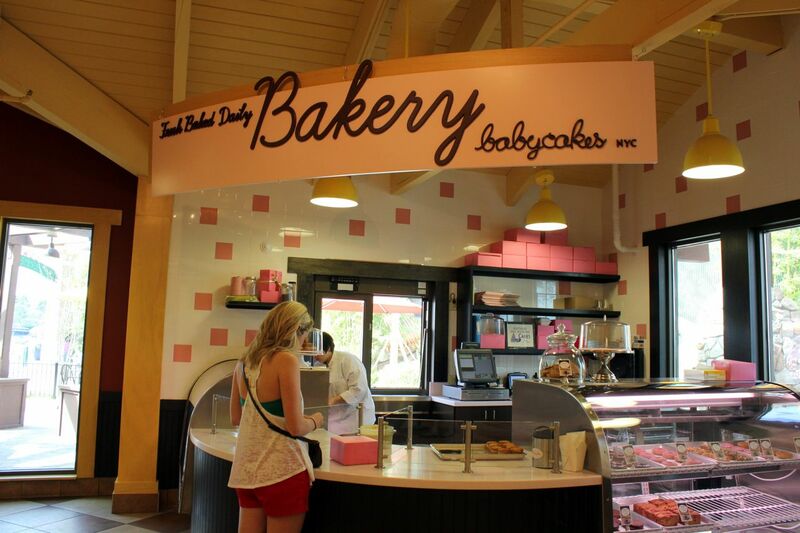 I visited BabyCakes for the first time on my last trip to WDW. I normally would avoid a place that proudly advertises “vegan”, “dairy-free”, “gluten-free” like the plague. But all the positive reviews I read and heard on various blogs and podcasts convinced me to give it a try. Oh man oh man am I glad I did. Absolutely delicious. I’m moving to the Orlando area in just three weeks, and BabyCakes is going to be a regular destination for me once I do. Very excited!! We’re glad to have you as a regular! Best of luck with the move, see you soon! Emily, I noticed that it was posted on Twitter and Facebook that your goodies will be available to add on to your WDW Dining Reservations. What exactly are the details with this? Is this just special celebrations like birthdays/anniversaries? Or, will there be desserts that can be ordered instead of tradtional menu options at a restaurant? I read on a message board already that someone tried calling Disney Dining Reservations line and they had no idea about the existance of BabyCakes let alone the dessert add-on option. Leave it to Disney Dining Reservations to be clueless… this isn’t the first time I’ve heard that. Also, will you be servicing Downtown Disney restaurants too or just Disney operated locations? Thanks, Em! See you in October! I was so excited to go to Babycakes when we were vacationing at Disney World last month. I love this bakery. I went three nights in a row and miss the treats so much. My favorite was the blondie cupcake. I bought the cookbook and have made a couple recipes so far. Super yum. Love you, Babyckes! 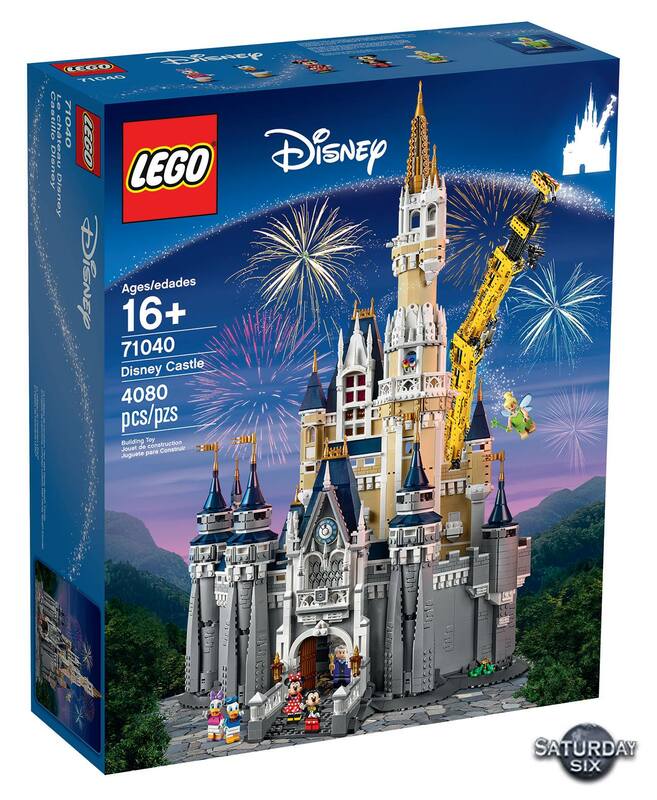 Will definitely drop in when we visit WDW next month. Any chance some of the ingredients are also organic or biodyamic? Many of the ingredients we use including our oils, agave nectar, and unrefined sugar are organic. Though we are not totally organic, we are proud to say we are “mostly” organic! Woohoo!!!! Those were the ones I was hoping for. Using organic oils is a really important choice. Gotta say, I really like the organic agave nectar as an ingredient. We’ll certainly stop by and partake of the goodies next time we are at WDW! Thank you!